"My kids have done incredibly well in middle school--I'm quite sure that the time spent in your classes was a key ingredient to their success!" "Why can't school be fun like this?" 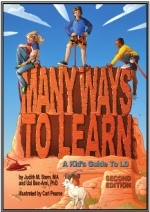 This new edition of the classic book Many Ways to Learn is written for kids with learning disabilities reassurance and knowledge to live confidently with their disability. This book provides easy-to-use tips, information, and strategies for kids to take on their disability, as well as empowering them to feel better and more capable. Click here for more information. Judith Stern, M.A. is an educational consultant in Rockville, Maryland specializing in work with children who have attention and learning problems. She meets with parents, provides consultation and referral services to schools in Montgomery County and the Washington D.C. area, and presents in-service workshops to schools and groups of professionals. She speaks nationally to professional and parent groups on subjects such as Attention Deficit Disorder, learning problems, homework strategies, behavior management and children’s organization and study skills. She consults with parents and attorneys on educational issues related to child custody decisions. Ms. Stern is the co-author of the best selling books Putting on the Brakes: Young People’s Guide to Understanding ADHD, which has sold over 150,000 copies and has been translated into seven languages and Many Ways to Learn: a Kid's Guide to Learning Disabilities. 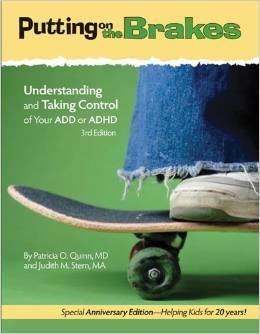 Ms. Stern has also published three other books for children on ADHD and Learning Disabilities, as well as magazine articles and professional book chapters. Her most recent book is The Dyslexia Checklist: A Practical Reference for Parents and Teachers. Ms. Stern’s professional background includes over 35 years of experience as a classroom teacher, a reading specialist and a learning disabilities teacher. She has taught in public and private schools. Her extensive experience in the fields of general and special education in a variety of settings contributes to a broad knowledge of issues faced by today’s students, parents and educators. Now Forming: One week summer or fall weekend classes for children entering grades 6 -12, conveniently located for students in Montgomery County and Washington, D.C. Register your child for a study skills class this summer. One week classes forming now. Click here for more information. Individual reading tutoring and testing for students in grades K-8 are available during the school year and throughout the summer. Judith Stern, M.A. 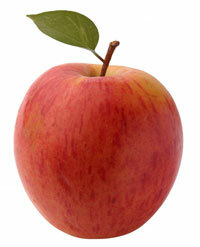 is a Maryland Certified Reading Specialist and experienced reading teacher. © 2015, Judith Stern, M.A.